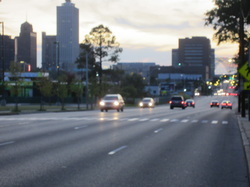 Looking west down Poplar St, dusk in Memphis, Bridge to Arkansas, background right. The next state to be visited. Luxury hotel, Memphis, enjoyed by all involved at the end of stage 1 of this ride. Arising at first light, relieved at its arrival, no breakfast was enjoyed, just a teeth clean, some ablution duties and a few photos, I was out of there. Not having had tea, with the last decent graze whilst at Ripley, hunger was an issue on my mind. I didn’t even have much water. Ironically the main enterance to the park was about 1 mile down the road, hey, it would have been a mundane night in the nest to say the least, had I made it. I stopped and talked to a couple of dear old ladies out for a walk. They mentioned that there was a general store at the stop sign up ahead. I again thought about my gift at Lake Winni in MN and the words associated with it . Some 500m down the road the Shelby Forest General Store was spotted. This building with its verhanda, benches and the characters on them were quintessential Tennessee as I had imagined it. I headed inside and grabbed a coffee and ordered B and E and HB’s. 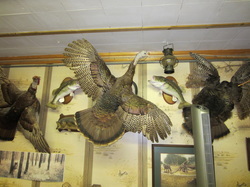 This was a classic store with all sorts of things adorning the walls, with stuffed local wildlife well represented. The owner was an amicable kind of guy, good with his tongue, getting a laugh from most he spoke to . A great breeky and copious coffee was enjoyed .The owners wife took over serving and was more than helpful in sorting out a hotel in Memphis, making numerous phone calls on my behalf. A cheapy I had sorted was south of Highway 55, an unsafe area, I was informed so thankfully . Leaving the store after another yarn with the verhanda crew, who incidentily do this every day, the trail led me through the most delightful wooded gentle hill country. It was so relaxing in the mild temperatures and shaded roads. 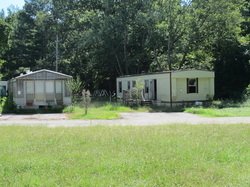 Closer to Memphis a huge trailer park that occupied both sides of the road was encountered. The May Floods had trashed the place with 15’ of water. Those that were insured, left, never to return and those that were not insured left with what they could get in their cars, broke, and also never to return. Life can be so utterly cruel to some. They trail guided me left then right, still with no site of Memphis, then it was upon me, as the reason for my presence here became visible. 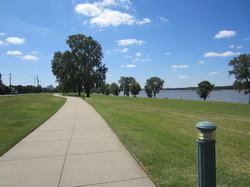 A riverside park guided me to Front Street and downtown Memphis . Looking for a motel I stopped at an empty bar and the girl immediately said that this was the last bar Hank Williams had an ale in before he died and Johnny Cash spent time in the hotel across the road, So much history of relavance to us all when thinking music. The Comfort Inn was booked ,the most luxurious so far. Booking a double room in the belief Leon, my travel companion to Niagara, Rhode Is, New York, DC etc over the next three weeks was arriving this evening. I had it wrong, he was arriving the next day as arranged, I was a day out in my reckoning, oh, such is this lifestyle. During the afternoon I braved the Memphis traffic and headed 10 miles east down Poplar street to a bike shop for repairs. The rear wheel needed truing, a new rear tyreand tubes were bought, a new stand was fitted, the derailers were tuned and chain oil was purchased .Memphis has no bicycle lanes, the footpath was used as an escape route on many ocassions. The bike was booked into storage for 3 weeks and some laundry bags were purchased to carry my clothes on the trip to NY by rental car. Prior to embarking on this adventure, I made a comment that meeting people along the way would make this journey. This utterance is so much of an understatement on my behalf. The people I have met in this part of the US are so friendly, honest ,kind and most importantly, are all of good humour, despite some hardships and obvious neglect by those in charge of this country. Their culture has been for me as of much interest as any travels in Asia. An heart felt thanks goes out to all those people who have made the last 12 weeks so fascinating and allowing me into their lives for a short time. I hope you enjoyed our time together as much as I did. I feel the Mississippi River gives and takes from the inhabitants along its corridor. The truth however is that the river does do her best to give. It is the weather, especially rain or lack thereof that makes her take from her environs and its people. Continuation of this journal will resume upon my return near the end of September. I am looking forward to interacting with the people who call the southern part of the Mississippi home . Thanks for following my account of this ride. Statistics on the site have shown that most days between 100 and 200 visits occur. So thanks to you all. I am sure Akansas, Mississippii and Louisiana will fascinate you and I both .